Congress now has two fewer days to deal with the debt ceiling. 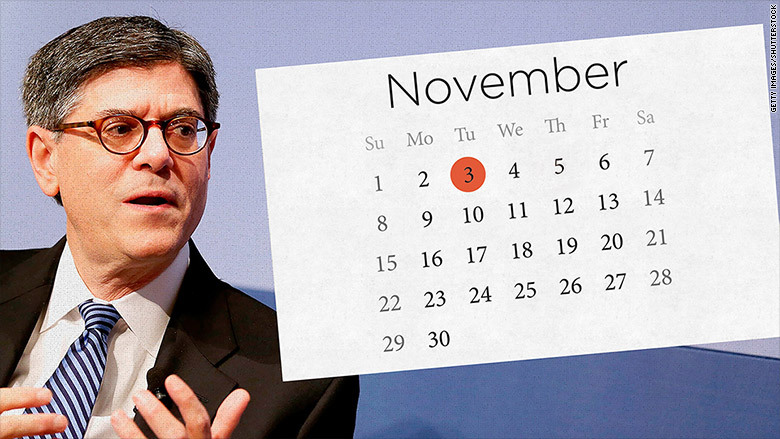 Treasury Secretary Jack Lew said Thursday he now estimates that "no later than" November 3, Treasury is likely to exhaust special accounting measures that are keeping the country's debt below its legal limit. Earlier this month, he had said the alarm would start to go off on November 5. Now, Lew said, he estimates that on November 3 the Treasury Department will only be able to pay the country's bills with the cash it has on hand -- which Lew expects to be roughly $30 billion -- plus whatever daily revenue comes into the Treasury. And soon after November 3, Treasury would not have enough money to cover the bills on some days, which can amount to $60 billion. That estimated "X" date -- when Treasury won't have enough money to pay what's due -- will come between November 10 and November 19, according to an analysis by the Bipartisan Policy Center. Separately, the Congressional Budget Office this week estimated the "X" date would come "sometime during the first half of November." "Operating the United States government with no borrowing authority, and with only the cash on hand on a given day, would be profoundly irresponsible," Lew wrote in a letter to House Speaker John Boehner.